Something slightly unusual about this is that this guitar suffered a headstock break while still in its case. This is unusual but not unheard of. I’ve seen a few in my time (and I mention it in my general article about Broken Necks). It’s a real pain to hear this but even a good case might not protect your guitar in all circumstances. 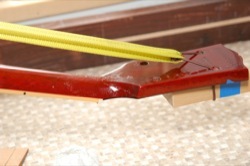 If you want to be even more safe, you can slacken off the strings before you pop your guitar in its case. Not the most practical solution but it is what it is. Anyway, we’ve looked at headstock breaks before but I wanted to show you some unusual clamping arrangements on this one. 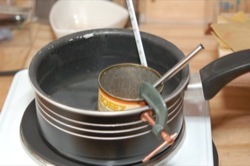 First off, let’s get the glue pot heating up. I’ll often use hot hide glue for repairs. If you use it correctly, it’s very strong and creep-resistant. I like the ‘traditionalist’ vibe of it too. Depending on the repair, it can be particularly suitable too (as it was in this case). And the next photo—whoa, what’s going on here? We’ve looked at various clamping methods before and discussed making custom cauls and whatnot. Sometimes though, headstock breaks can be very soundly and securely clamped by the clever application of ratchet compression straps. “Are you mental?” I hear you cry. Nope. 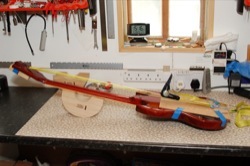 If the neck crack is held on by the headstock veneer and, if it mates cleanly and securely, it can often be easier to use this method of getting the break back together. 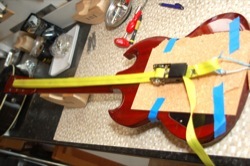 The strap is secured at either end—around the strap-button and through the tuner holes—and it can apply a strong, directional pull to keep the break together for glueing. The block of wood I’ve used at the front of the headstock just protects it. Likewise, the cork padding on the rear of the body. Once the glue has been applied where it’s needed, tightening the ratchet applies the pressure that pulls the cracked headstock together again. 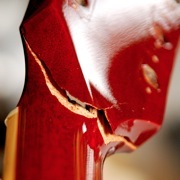 There’s plenty of force—in fact you could probably pull the headstock off completely if you over-tightened. Let the glue cure and clean up the excess with some hot water and a rag (another great advantage of hide glue) and it’s done. This guitar will be making another appearance soon. Stay tuned. Incidentally, I didn’t invent this clamping method (more’s the pity). Years ago, Stewart MacDonald’s catalogue used to include occasional tips from guitar techs and luthiers. I read this there and have been thankful for it plenty of times since. Haze Guitars provides guitar repair, restoration and upgrade services and makes beautiful, hand-built instruments.